The Matansuka-Susitna Borough, (MSB), Has several levels of zoning. The cities of Palmer, Wasilla, and Houston have the type of zoning you might find in most planned cities in the country. But those cities only comprise less than 1/500th of the borough’s land mass. The rest of us are in the borough but not in any city. Those of us outside of a city can form a community council which in turn can form a Special Use District, (SPUD), which restricts land use within it’s boundary. A council’s boundaries are often quite large. For example, the city of Wasilla is 12.4 square miles but the Meadow Lakes Community Council governs over 48 square miles. The population of Wasilla is just over 8,600 and the population of Meadow Lakes is about 8,400. We certainly hear about elections in the city of Wasilla. Bert Cottle was recently elected mayor and congratulations to him. But did you see people waving signs at the corner of Pittman and Parks for the community council election? I didn’t. My point is that community council elections can do more to change your life and the value of your property than presidential elections. People should pay attention to them. Once the council is elected it makes major decisions regarding land use in your area. You may have been considering adding another residence on your property for a rental, or perhaps raising livestock. You better check your SPUD to see if that is possible. I learned of a sale that recently fell apart because of a pending SPUD that might restrict the use of a property. For that potential land owner his perceived value of the property was directly affected by the actions of the community council. You can see why it is important to become involved. 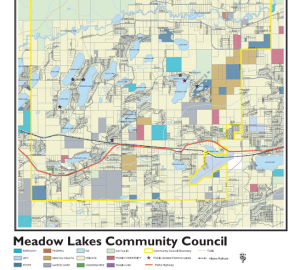 Currently the Meadow Lakes Community Council has put forward a SPUD for approval by the MSB assembly. You have until January 5, 2015 to voice your concerns. It would be very important to do so now if you want a say in what happens in your community. You can find more info here.